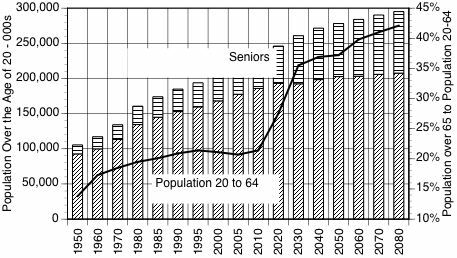 The sudden rise in the ratio of the "aging population" (population over 65) to the "workforce population" (population from 20 to 64) represents a dramatic shift in the demographics of aging in the the U.S. The causes of this shift are sudden and not generally acknowledged. The birth rate has declined for the "millennial" generation that marries late or does not marry at all is finally encountering increased longevity of the aged, as improved health care reduces morbidity. The implications on the retired seniors are far reaching: there will insufficient financial capacity of the workforce population to support an aging population.